Here's the news you all have been waiting for!! GABBA is pleased to announce more details on GABBAfest 2014. Once again, we will be at The 567 Center for Renewal on Friday and Saturday, September 26 & 27, 2014. 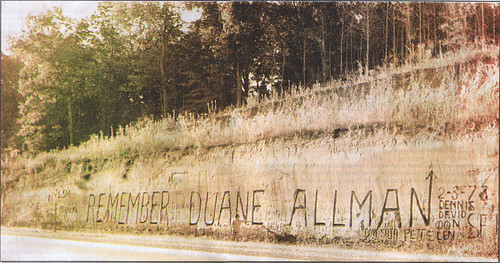 Our theme this year is “In the Footsteps of Duane Allman.” With two fine books by Galadrielle Allman and Alan Paul released this year covering much of Duane’s early life and the formation and development of The Allman Brothers Band, it only seemed like the logical choice. Many of the weekend activities we will have lined up are still in the formative stage and will be announced a little later. Opening the weekend festivities on Friday night will be Atlanta, Georgia's very own Freddy's Finest! This band is comprised of some of Atlanta's finest performers, including our old friend, Michael Hurwitz, who played GABBAfest in 2006 with Tony Tyler. Our Friday headliner, which we are very excited about, will be, for the first time in Macon, GA, The Decoys from Muscle Shoals, Alabama! The Decoys feature guitarist/vocalist Scott Boyer of Cowboy fame, bassist David Hood of the legendary Swampers , guitarist Kelvin Holley, keyboardist N.C. Thurman and drummer Mike Dillon. This promises to be a memorable set! On Saturday night, local Macon favorites, Window Plane, will be playing the opening set, and you can bet they will cover some of your favorite Allman Brothers Band classics! If you have been to any of the Skydog birthday concerts in City Central Park, you know what I’m talking about! And finally, our Saturday headliner is GABBA’s “Old Friend,” all the way from Murfreesboro, TN, former Allman Brother, Jack Pearson and The Jack Pearson Band!! This is Jack’s return to GABBAfest, having played for us last at GABBAfest 2007. Jack has been very busy lately, playing many shows in his native Nashville at 3rd and Lindley, but he really generated a buzz when he was chosen to handle guitar duties in the house band as part of the Gregg Allman tribute show in Atlanta at the fabulous Fox Theater this past January. We will have more announcements about Saturday afternoon activities coming real soon! Hope to see y’all in Macon, Georgia for GABBAfest 2014! I've been to 3 GABBAFEST events going back to the 90's and had a great time at each one. Been awhile since I've been so I'll have to see if I can make this one. Having the Decoys and Jack Pearson attend will make it even more special. I am so glad Scott Boyer is well enough to be playing again. He is doing a few w/ Tommy Talton in the near future too (Tommy's site had some listings). KUDOS to GABBA! This really sounds and looks fantastic. I've threatened numerous time to take my wife to a GABBA event. This may be the year. It's like a one, two punch with The Decoys and Jack Pearson. Great job to all the organizers of this event. Wow!!! Sounds like a great weekend. Do you know if the hotel will be the Marriott again this year? Would like to get to Macon a few days before the fest. Also, any word as to whether the H & H will be open by then? The fried chicken was just about the best I've ever eaten. Bluedad I would like to make this my first GABBA Fest. Where will I be able to purchase advance tickets? I have check the GABBA official site. We shall see you in September. Have our room booked at the Marriott and looking at possibly flying this year. Spoke to somebody yesterday who said he will make a point to update the GABBA website this week with ordering information. The weekend will be supposedly be $45, but the single day shows will be on a first come-first served basis. He also mentioned Jack Pearson wanted to come in on Thursday night, so he'd have an opportunity to sit in with others. I'll put this on my list and hope I'm up to it. Sounds wonderful !! People can you feel it....Love is everywhere. Just chiseled this onto my calendar! Can't wait! Okay, I've booked the room for two nights. Now, how $much are tickets? Can I buy them cheaper in advance? Where, how? Just made my reservation. Great rate. Thanks gentlemen. Seeing you all in September! Woohoo! Hey gang! We’ve got more info about GABBAfest 2014 to share with you! As announced previously, this year's theme is "In the Footsteps of Duane Allman." On Saturday morning, the Bond Street home that Duane and Donna Allman shared before moving into the Big House will be open for tours. Many thanks to the Teodecki's, the home's current owners, for allowing us access to this piece of Allman history! Also, Rock Candy Tours will again open Capricorn Studios for tours. Gary Harmon from the band, Boogie Chillun, who gigged early on with The Allman Brothers Band in Macon and Atlanta, will be on hand to tell stories about rehearsing in the Capricorn building. Mercer University has agreed to open the Bell House on College Street, location of The Allman Brothers Band’s first album cover shoot, which was next door to “The Hippie Crash Pad,” first apartment many of the band and crew stayed in upon their arrival in Macon in 1969. It is presently being used by Mercer as The Robert McDuffie Center for Strings. Folks who visit Macon always take photos next to the giant pillars on the front porch in an attempt to recreate the famous photos used for the album cover. Now you can see the inside of the home! Thanks Mercer University! Times for the tours will be announced soon. This year, The GABBA Members Jam will be held at The Library Ballroom on Mulberry Street, formerly The College Discotheque, site of the first Macon gig The Allman Brothers Band played upon their arrival in Macon in May of 1969. Earlier this year, a historic marker sponsored by GABBA was placed on the building to commemorate the gig, and is another site on the GABBA “footsteps” map. Back by popular demand, the jam will be hosted by Mystery Road. The boys in Mystery Road have become great friends of GABBA over the last few years and we have really come to love them as brothers! The jam this year promises to be another barn burner! We are SUPER stoked that Galadrielle Allman, daughter of Allman Brothers Band founder, Duane Allman, has accepted our invitation to be our guest at GABBAfest 2014. Galadrielle published her book, Please Be With Me – A Song For My Father, earlier this year, to much critical acclaim and success, and it gives a unique perspective on the early life of The Allman Brothers Band, from the viewpoint of the women who held down the fort and kept the home fires lit while the boys in the band were busy touring and creating a musical movement that continues to this day. One unfortunate announcement to make, though, is The Decoys storied bassist, Muscle Shoals “Swamper,” David Hood, will not be able to play with The Decoys on Friday night as originally intended, as a studio session he had booked got postponed and rescheduled for the weekend of GABBAfest. We’ll miss David, but the bass duties will be handled by the capable hands of Cowboy bassist, Stan Robertson. As we do every year with GABBA, we will be giving the GABBY award out on Saturday night, and on Sunday around noon, we will gather at Rose Hill and plant a tree and place a marker for someone near and dear to the Allman Brothers legacy. We are keeping it a secret, but I think everyone will agree it is special and well deserved. The H&H Restaurant is reopening this month! We are THRILLED that it will be open in time for GABBAfest 2014. The H&H has always been a part of the Allman Brothers Band pilgrimage to Macon. Big thanks to The Moonhanger Group for saving this Macon institution and GABBA tradition!! We have locked in the special GABBA rate ($89.95 + taxes/night) once again at The Marriott. Rates are good from Thursday through Sunday nights, but you must book the room by 8/26/14. Why don’t you come on into town on Thursday night and head over to the Cox Capitol Theatre and see J.J. Grey and Mofro? Also, Friday afternoon, Grant’s Lounge will be open for happy hour before GABBAfest commences. For registration forms for GABBAfest 2014, visit our website at www.gabba.org, or shoot us an e-mail at gabba.georgia@gmail.com. As more developments arise, we will get them to you! Eat a peach for peace!